Are you considering to apply for a PhD position at Casimir? During the Casimir Open Days on 6 and 7 June 2019, we will open our doors to 20 talented prospective PhD students. During the Open Days, we offer prospective PhD students a two-day program to get to know our research. The program will consist of several interesting lectures by our PIs and visits to the research labs in Leiden and Delft. Also there will be plenty of time to get to know our current PhD students. An overview can be found below, a more detailed program will be available in April. 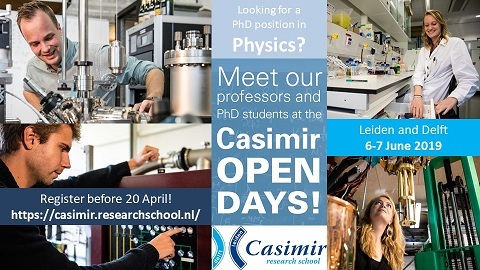 Students currently enrolled in a Master's Program in (Applied) Physics, either in the Netherlands or abroad, can apply for the Casimir Open Days by filling in the form below. After completing the form, please also send your cv and a recent grade overview to: boonstra@physics.leidenuniv.nl. If you have already spotted a research group and/or a current vacancy in one of our groups (for example see below) that you want to get to know more about during the Open Days, then please also indicate this in your e-mail. The registration deadline is 20 April. On 23 April 2019 we will personally inform each applicant on the decision of the application committee. The selected students will receive a detailed program of the Open Days. The Casimir Research School covers the costs for meals and lodging on 6 and 7 June. For students coming from abroad there is some additional funding available: we will award ten travel grants, with a maximum of € 200.- per person. Please register by filling in the form in the below and sending your files to the abovementioned e-mail address. The data will be used for organizational purposes only, we won't keep it in our archives longer than necessary.